According to PayOnline.ru, the volume of the Russian e-commerce market is $33.6 billion. More Russians are spending more money on making purchases on the internet. Statistics indicate that the average amount spent on buying products online has increased 23 percent in the first half of 2015. Analysts suggest that a reason for increased spends on the net may be the fall in the ruble’s exchange rate. Over the last year, the Russian currency has lost half its value against the U.S. dollar and the euro. While the ruble continues to flounder against the dollar, Russian web users have begun to spend more money to buy goods off the internet. Data recently published by an analytical company Synovate Comcon, average spending by Russian consumers on different kinds of products and content on the net has risen 23 per cent in the first half of 2015, compared to the same period last year. In the first three months of 2015, a Russian web user paid an average of 691 rubles ($11.6) for games, movies, software, books and other types of content from the internet. While this is still a small fraction compared to what internet users spend in the West, it represents a significant increase for Russia. “This increase is quite explainable in terms of economic factors,” said Tatyana Komissarova, dean of the Higher School of Marketing and Business Development at the National Research University Higher School of Economics. “The purchasing power of the population has fallen by 7 percent, inflation factored by the Central Bank is about 14 percent, while wages are not indexed. In sum, all these three factors show the figure of above 21 percent,” she said. According to Komissarova, the cost of content on the internet is lower than that of similar products offline, and Russians are finding it easier to save money this way. According to data from Synovate Comcon, about 46 percent of Russians are spending money on games, 42 percent are paying for applications for smart phones or tablets, while 30 percent of Russians are buying software. In turn, according to a ranking of the 100 biggest sellers on the Russian internet compiled by the authoritative Russian publishing house Kommersant, the country’s biggest internet vendors are the national railway operator Russian Railways and Russia’s largest airline Aeroflot. Hence, the authors of the ranking point out, Russians are primarily buying tickets online, with transport companies being followed by the sellers of household appliances and major online stores. “Undoubtedly, the growth in the number of payments has also been influenced by the weakening of the ruble. Where earlier we had to pay, for example, 169 rubles for music at the exchange rate of 30 rubles per dollar, now we are paying the same amount at the rate of 60 rubles [to the dollar], which creates the illusion that the content has fallen in price,” said German Klimenko, director and owner of Liveinternet.ru (one of the biggest blog services in Russia). However, according to Timur Nigmatullin, an analyst with the investment holding Finam, everything seems to indicate that the trend is due mainly to technical factors. “The internet is evolving, it is coming to distant and small towns, where young people are getting an opportunity to find the content they need, without waiting for a new film to arrive in their town or village,” she said. 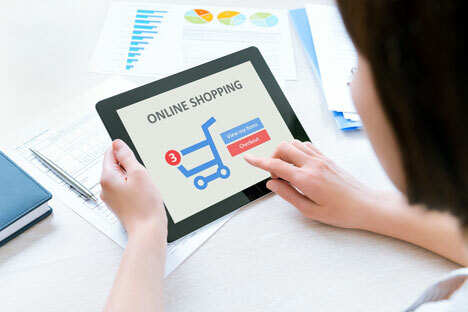 For this reason, according to Nigmatullin, the online shopping market in Russia is seeing double-digit growth even in a difficult economic environment. “Undoubtedly, this industry is interesting for investment. In my opinion, as the popularity of smartphones grows, such market segments as streaming services and mobile games will also show relatively high growth rates,” he said. In turn, according to Klimenko, it is players who are already working in Russia – both Russian and foreign companies – that are likely to act as investors.